Cash pickup allows you to withdraw cash from the register and record it in the software. For example, maybe your employees do drops into your safe or maybe you withdraw money from the register to deposit into your account. You can record these activities in the software as cash pickups since they are not an expense. Cash pickups are not expenses because they do not occur daily, weekly or monthly. Click on the Cash Pickup. Select the payee( Person/ Company who is picking the cash)by clicking the drop down menu OR create a new payee by clicking the drop-down menu and clicking on the Add new payee button. Then click on the Cash Pickup. Select the Period/date by clicking on the drop-down menu and selecting a time period. Or Manually select the dates by clicking on the "From" and "To" drop down menus. Select your cash pickup from the cash pickup list. 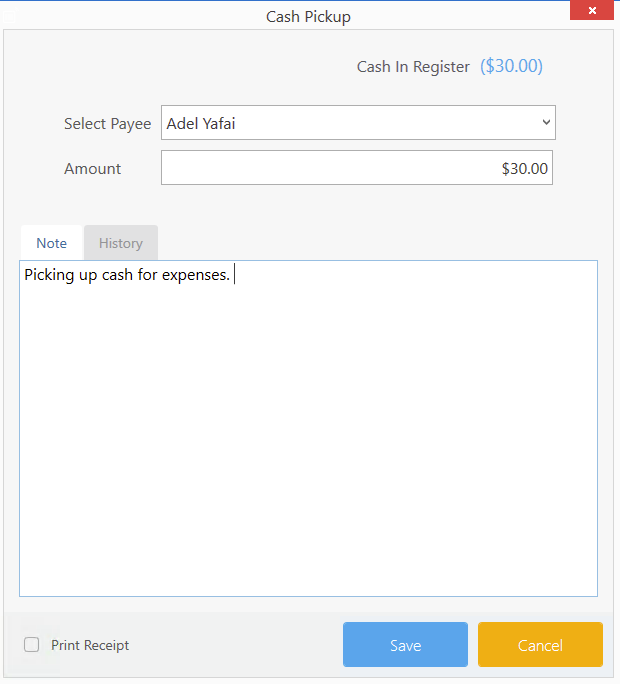 Clicking on the show cash pickup history option while creating a cash pickup will allow you to view all the past pickups that were made by the payee you selected. This will help you in remembering the amount of the pickups that were made and the employee who created the cash pickup. Enter any details regarding the cash pickup in the notes section. This information will only be visible to the user and will not be printed.